Signed by Hemmings with inscription to "Howard"
Softcover 8 1/2 x 10 1/4, self-published?, 1997, FIRST PRINTING SOFTCOVER. 151 pages. Vintage b/w photos and color photos. "The Soul of Surfing captures the roots and growth of the sport as told by former world champion and father of modern-day professional surfing." 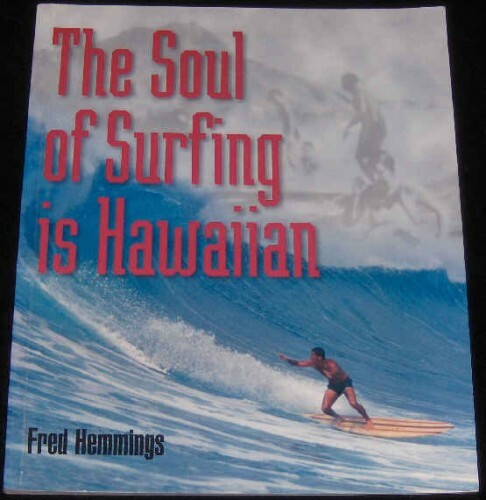 "Fred Hemmings explores the true personalities that made the sport of surfing what it is today." A good overview of surfing in Hawaii's past and present coupled with the perspective of the author, a former surfing champion himself. Lots of action photos and some vintage as well, features the top names in the sport of surfing today and from the past. "The boldness with which we saw [the Hawaiians] perform these difficult and dangerous maneuvers was altogether astonishing. . . . " Penned over 200 years ago, Captain Cook's words could be written today with no less awe or sincerity. In Waikiki, the Hawaiians were the first people to harness the surf as a source of pleasure. Where, for thousands of years, cultures living on the coastlines of the world's great oceans had seen waves only as menacing natural adversaries, the Hawaiians saw fun. Today, as surfers push the boundaries of wave riding, the ultimate test for the surfing elite remains Hawaii's formidable waves. The Soul of Surfing is Fred Hemmings's "talking story" about surfing's culture and history, his own long association with the sport, and everything from surfer slang to the daredevils who risk death to challenge the big waves." The Hawaiian Chain by E. H. Bryan, Jr.